I’ve been patiently waiting for my cousin to perfect her shortbread recipe so that I could try it out for myself, and it was well worth the wait. There are very few ingrediants, so it’s very simple to knock up a batch of dough in next to no time. 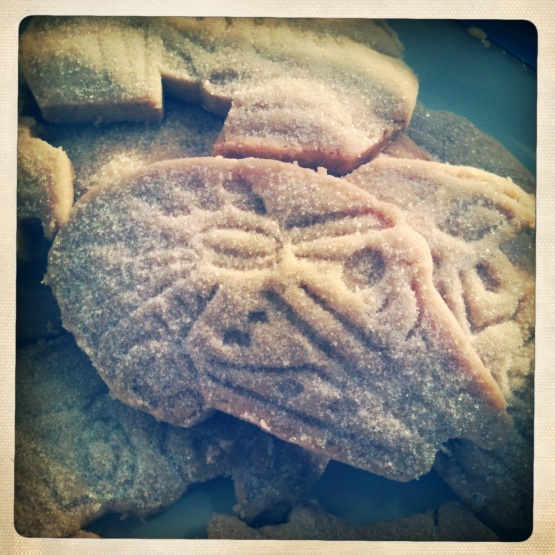 As I still hadn’t tried out the second set of Star Wars cookie cutters that I got from Williams-Sonoma last year (yes, I have two sets), I decided to knock up some Star Wars shortbread in the shape of the Millennium Falcon (pictured), Tie Fighters, X-Wing Fighers and the Death Star. As you do. First, in a large bowl, cream the butter together with the sugar with a fork. Next, add the two types of flour and mix to form a dough. Once rolled into a ball of smooth dough, wrap in clingfilm and put in the fridge for an hour or so to chill. Preheat the oven to 180 °C (160°, fan oven)/350 °F/gas mark 4. Next, roll the dough out to about thickness of about 0.5mm/0.25in. The dough is quite crumbly so it’s a bit of a bugger to roll out. You’ll need to be very gentle and persevere, but I promise you it’s worth it. If the dough cracks while rolling, just gently push it back together and carry on rolling with care. The trick is to handle the dough as little as you can and to make sure that both your hands and the dough are as cool as possible. 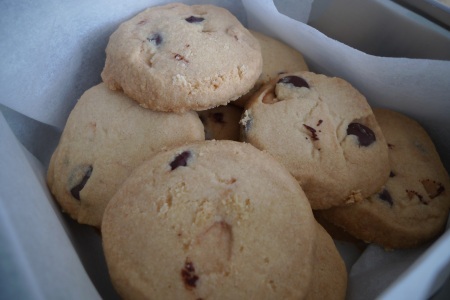 Once you’ve cut the shapes out, put them on a greased baking tray (I just use a Teflon baking sheet) and bake at 180°C (160°, fan oven)/350° degrees F/gas mark 4 for approximately 12-15 minutes or until the biscuits begin to turn golden brown around the edges. After taking them out of the oven, leave the biscuits to cool for a couple of minutes before transferring them to a wire rack to cool completely. Immediately after you put them on the wire rack, drench them with caster sugar (it’s best to put some newspaper underneath the rack to catch any stray sugar). Once they’re cool, you cake shake the excess sugar off and then you’re ready to rock ‘n’ roll. Tonight is Burns Night – an occasion on which the birthday of Scotland’s most famous poet, Robert ‘Rabbie’ Burns, is commemorated. A traditional Burns Night supper usually involves scoffing a haggis, neeps and tatties. I didn’t really think that a Haggis cake would prove too popular, so instead I decided to concoct some Irn Bru-based goods instead. 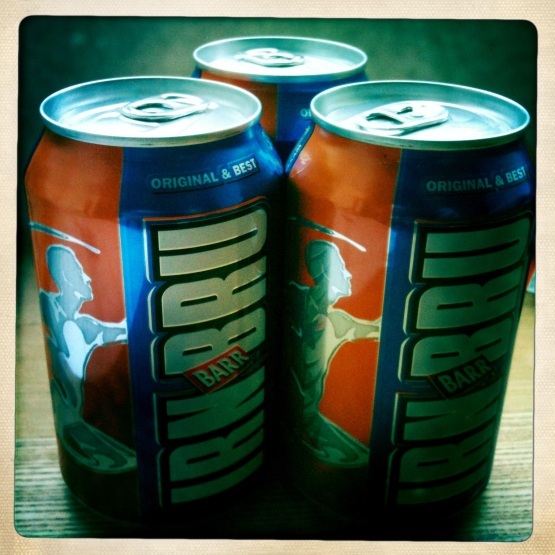 I’ve loved Irn Bru ever since my Glaswegian grandad used to buy it for me and my brother as kids. If you’re not familiar with this tasty beverage, it’s a bright orange fizzy drink from Scotland. As well as being popular with sweet-toothed kids, it’s also well known as an effective hangover cure, probably due to the preposterous levels of sugar and caffeine that it contains. 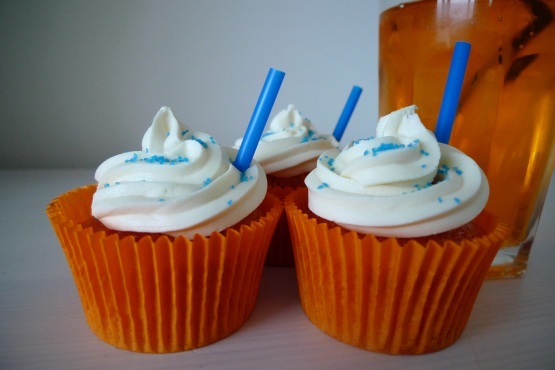 And so, without further ado, here’s my recipe for Irn Bru cupcakes. They go particularly well with a wee dram of whisky. First pre-heat the oven to 180 degrees C/160 degrees C (fan oven)/Gas mark 4, then line a cupcake tin with cases. So far, so easy. Now get yourself a large bowl and mix together the flour, sugar, bicarb, baking powder and salt. Next get a pan and gently heat the butter and Irn Bru on the hob until the butter has melted, then remove from the heat. Next, get your buttermilk ready in a measuring jug. If you can’t find, or don’t have any buttermilk, use regular milk instead, add a squirt of lemon juice and leave for five minutes. Beat the egg and vanilla extract into the milk. Once you’ve done that, add the butter mixture and the egg mixture to the dry ingrediants and combine with a wooden spoon. I also added some orange food colouring paste at this point to enhance the colour, but it’s not essential. Now spoon the mixture into the cases, dividing it evenly between all 12. Bake in the oven for 15 minutes. All ovens vary, so you might want to check on the cakes after ten minutes (without opening the oven door). They should be ready once they’ve risen and are firm but slightly springy to touch. 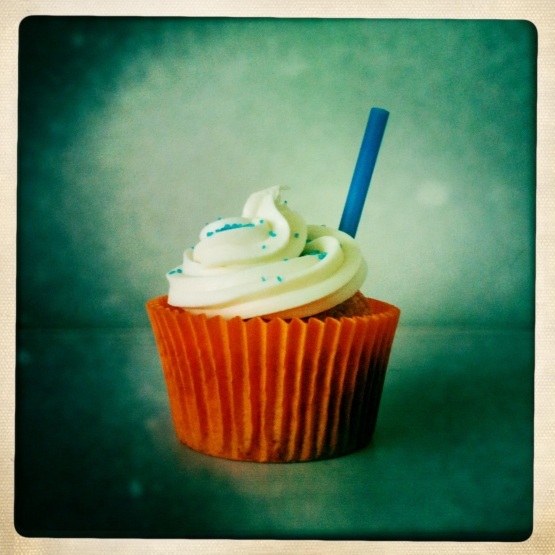 If you want, you can double-check by inserting a skewer or cocktail stick into the centre of one of the cakes. If it comes out clean, they’re ready, if it’s covered in wet cake mixture, then they need longer. Once done, take the pan out of the oven and leave to stand for five minutes. After that, transfer the cakes to a cooling rack. Once the cakes are completely cooled, crack on with the icing. Using a fork, combine the (sieved) icing sugar with the butter in a bowl. If you want to, add the vanilla extract. Then either spread the icing on with a palette knife or pipe it on and add whatever sprinkles or decorations you see fit. Over here in the UK a lot of people think that the chocolate in the USA is terrible, and in some cases I have to agree. Although on occasion I can be somewhat partial to the synthetically tasting stodge that is Hershey’s chocolate, I can fully understand why choc conosseurs turn their noses up at it. For those people, I would point them towards San Francisco-based choc company Ghirardelli. 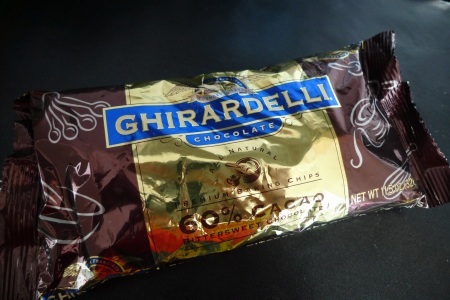 On a recent holiday to San Francisco, I tried (and failed miserably) to contain my excitement on entering the well-stocked chocolate shop at Ghiradelli Square – the original site of the brand’s factory. Packed floor to ceiling with goodies, some that I had seen before elsewhere in the US, and some which seemed to be exclusive to the shop, I walked around in a daze for an embarassingly long amount of time, trying to decide what to buy. In the end I opted for an entire basket-full of treats including (but certainly not limited to) a pack of baking chips.